America’s Infrastructure Being Ignored by Grabby Bureaucrats in Washington! Sen. Lee Says Our Transportation System is a Mess. Travel Becoming Harder in America; whose fault is it? “Today, the president has offered the country the same old idea: send more money to Washington where the special interests get their cut, the politicians get the credit, and future generations get the bill. Unfortunately, his proposal is more about preserving a dysfunctional system than improving our roads. It’s a top-down, DC-knows-best approach to do to our transportation infrastructure what Obamacare has done to our health care. “Conservatives have a fresh approach that will save money, reduce commuting times, grow the economy and create jobs, and allow state and local officials, who are ultimately responsible for infrastructure projects, to respond more quickly to the transportation needs of each state. “The Transportation Empowerment Act creates a new system where Americans would no longer have to send significant gas-tax revenue to Washington, where politicians, bureaucrats, and lobbyists siphon off precious resources before sending it back to the states with strings attached. Instead, under this proposal, states and cities could plan, finance, and build better-designed and more affordable projects. “Some communities could choose to build more roads, while others might prefer to repair old ones. Some might build highways, others light-rail. And all would be free to experiment with innovative green technologies, and new ways to finance their projects, like congestion pricing and smart tolls. LAMY, N.M. — For 18 years, Maryalice Garrigan has been taking the train from this wisp of a town near Santa Fe to visit her family in Albany, spending four days to reach New York via a connection in Chicago. She cherishes the annual ritual: Sipping the whiskey she packs in a cooler, and tracing the creeks and mesas that whiz by with a map she brings on each trip. But now the historic route of the Southwest Chief, which runs between Los Angeles and Chicago, is in danger of being altered, a shift that would sever a practical and symbolic lifeline for Lamy and other struggling rural communities. People here and in other small towns along the train’s path say that if Amtrak leaves, Lamy — population 200 — will simply dry up and drift away across the high plains. Amtrak, which has operated the Southwest Chief since 1971, has asked Colorado, Kansas and New Mexico to each pitch in $40 million over 20 years to help pay for track upgrades and maintenance it says are needed to keep the route viable. But some state officials are balking, saying that Amtrak, which draws financial support from the federal government, should cover the costs itself. If no deal is reached by the end of the year, it could mean both an end to a storied railroad route — one that generations of Americans have used to travel across the West and glimpse the old frontier — and to the utility of places like Lamy, a longtime railroad junction where El Ortiz Hotel, built in 1896, was once a symbol of luxury. “Where would the train go?” asked Ms. Garrigan, waiting at the station here with a dozen other travelers on a recent Sunday afternoon. “They can’t take it away — there’s too much history,” she said. Gone are the days when well-dressed families en route to Los Angeles or Chicago would peer out at Lamy from their seats in dome cars. The town’s lone restaurant and saloon has been transformed into a railroad museum. A small plaque marks where El Ortiz Hotel once stood. And cartoonish signboards of Native Americans still stare out from the front of an out-of-service dining car — stage props of sorts, from a time long past. But the tableaus of badlands and desert, the lonesome stretches of railroad, are still there. At several legislative hearings this month, county officials from northern New Mexico implored lawmakers to keep the railroad route alive. “We need this train here,” said Jim Maldonado, chairman of the board of commissioners for Colfax County, where the train stops in Raton (population: 6,700), bringing thousands of Boy Scouts each year for retreats before dropping over the Raton Pass and into Colorado. At issue is who will shoulder the financial burden of modernizing the route. The railroad track is owned by Burlington Northern Santa Fe Railway, a Fort Worth company that manages slower freight trains on the line. Amtrak says that the tracks that guide the Southwest Chief will soon be unable to withstand the speed that a modern passenger train needs to stay efficient, and that track replacement is most pressing in New Mexico, Colorado and Kansas. The total cost to upgrade the route would be $200 million, Amtrak says, and it and Burlington Northern Santa Fe would each contribute $40 million. But with its contract with the freight train company up at the end of 2015, Amtrak wants funding assurances from the states as well — and soon. Unless all three states pitch in, Amtrak says it will potentially drop nine small-town stations in favor of existing track in Texas and Oklahoma. “The train is not viable as a business when it operates at a lower speed, because it ends up being slower than driving,” said Marc Magliari, an Amtrak spokesman, adding that the company does not have the funding to pay for the upgrades on its own. The Southwest Chief, which runs in both directions once a day, needs to reach 79 miles per hour wherever possible to make its scheduled stops on time, Mr. Magliari said. If old track is not replaced soon, he added, the train will have to travel at slower speeds for longer distances. Before Amtrak took over the line, a predecessor train called the Super Chief ran for many years, operated by the Atchison, Topeka and Santa Fe Railway. So far, the administration of Gov. Susana Martinez in New Mexico has been wary of supporting Amtrak’s plan, pointing out that the railroad already receives annual federal funding for operational and capital expenditures. Colorado could lose stops in the towns of Trinidad, Lamar and La Junta, each of which has a population of less than 9,000. These towns, like their New Mexico counterparts, have seen fortunes fade over the years, as coal mines, a military base and a bus factory all closed. Leroy Garcia, a Democratic state representative from Colorado, recently introduced legislation to preserve the train route and add a stop in the city of Pueblo. Under his proposal, which has drawn bipartisan support from Colorado lawmakers, a commission would be created to find funding and figure out the cost for an additional stop. Colorado’s governor, John W. Hickenlooper, supports keeping the train operating and expanding its route, said a spokesman, Eric Brown. But Mr. Brown said that the issue was “principally a federal funding issue,” and that no money for the project was included in the proposed budget pending before Colorado legislators. Kansas is also weighing how to proceed. If Amtrak changed the route, the Southwest Chief would no longer stop in Hutchinson, Dodge City or Garden City — populations 42,000, 28,000 and 27,000. “All parties would need to be at the table financially to make this work,” said Sara Belfry, a spokeswoman for Gov. Sam Brownback. 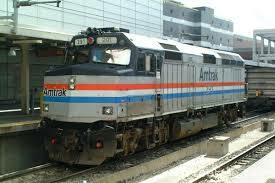 Amtrak said that ridership on the route has held mostly steady over the years, at more than 250,000 passengers a year for the last decade. The Southwest Chief is one of its top financial performers for long-distance trains, the company said, and keeping the route would help boost the economy of the region. For passengers like Ms. Garrigan, who is 48 and works at the Taos Ski Valley resort, the solace she finds on the train is the greatest advantage of all. “It’s so much less stressful than flying,” she said. As the Southwest Chief shot out of the Ortiz Mountains in the distance and hurtled toward Lamy, she smiled widely, grabbed her bags and prepared to board.